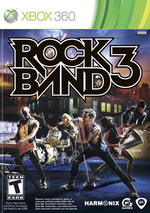 Rock Band 3 is the third main release in the iconic video game series that challenges gamers to live out their Rock & Roll fantasies together in a band situation, both locally and online. 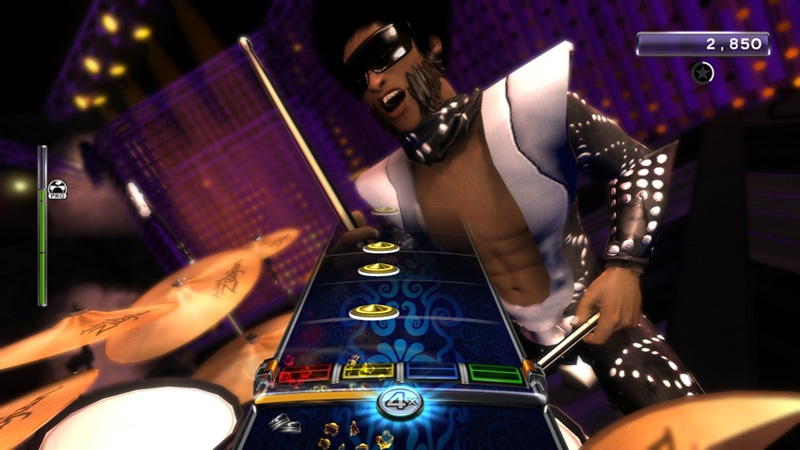 The game features an ever expanding song list from every era of Rock & Roll history, easy to pick up yet challenging addictive Note Highway gameplay, compatibility with earlier releases in the series and all platform-specific instrument controllers including most Guitar Hero controllers, extreme in-game character and band customization, and a slew of new features. These new features include: new setlist search functionality, the addition of 3-part harmonies and a keyboard peripheral and expanded play modes, including the advanced Pro Mode. The unavoidable reality is that, for all Rock Band 3's considerable refinements and intuitive advancements, your current games and equipment will probably suffice if you're just after banging a few plastic keys to the odd tune every now and then. But if you've still got a passion for the genre, or you're seriously considering furthering your understanding of the instruments with Pro mode, Rock Band 3 might just be the most important rhythm game to date. Harmonix revisits its roots to create a risky and adventurous music game that re-blurs the lines between fantasy and reality--but not at the expense of a fundamentally terrific experience that's accessible to most anyone who plays it. The level of commitment that pro mode demands is unquestionable, not to mention the investment required, but for dedicated players willing to throw themselves to the speakers, Rock Band 3 offers an avenue of musical exploration that you may not have thought possible in a videogame. 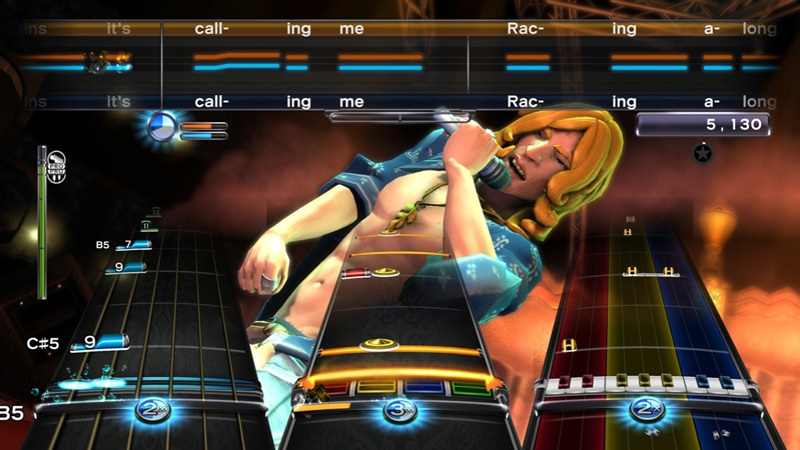 In many ways, Rock Band 3 is a culmination of Harmonix’s efforts to bring music to the masses. But it’s also a new chapter in the franchise that starts the gradual merging of real and game-based music. Plenty of naysayers have already declared music games dead. Harmonix certainly hasn’t gotten the message; this band is primed for a new tour. Video games -- not just rhythm games, but all video games -- rarely show this much ambition. Even more rare are occasions where developers manage to fulfill the impossibly lofty goals they set before themselves. 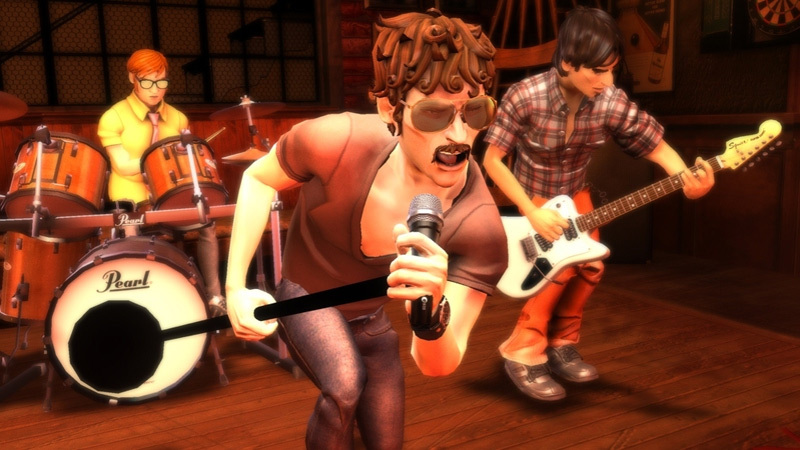 Rock Band 3 manages both with ease, backing up brilliant ideas with flawless execution. It raises the bar so exceptionally high that, once again, it's just about impossible to see where the rhythm genre is going to go from here. The game offers plenty of chart-toppers and big name acts like Queen and The Doors, but we actually found the lesser-known tracks from bands like Rilo Kiley and The Smiths stuck in our heads even more often. Every song fits the game perfectly, not only because it’s a blast to play but because it’s a joy to listen to. The songs really help to make the whole experience special, and we adore Harmonix for choosing so well. So with Rock Band 3, Harmonix has introduced the keyboard, the last of the common rock instruments, as well as a set of instruments that eliminate the distinction between playing a game and playing an actual instrument, wrapping it all up in a package that makes itself almost entirely passive to the way you want to play Rock Band 3. Like I said at the top, I'm not sure where else there is to go, but I don't really care. I'm having too much fun right now. A slick menu system ties it all together, making it easy to swap around difficulty levels, instruments, and even profiles without having to back out to the main menu. It seamlessly incorporates all your downloaded or imported tracks, and pipes in leaderboard info to fuel the competitive fire within. Rock Band 3 not only introduces new and exciting things to the world of rhythm games, but it does almost everything better than those that have come before it. When it comes to accessible, inventive, and immensely entertaining music video games, nobody does it better than Rock Band 3. The real joy of the game is in the countless ways it can be enjoyed. It has months, possibly years of enjoyment built in that can be harnessed at the player's own pace and budget. Breathtaking in ambition and crafted with the skill of a studio that's been making music games for 15 years, Rock Band 3 is Harmonix's masterpiece – a towering achievement not just for the genre, but for the medium itself. 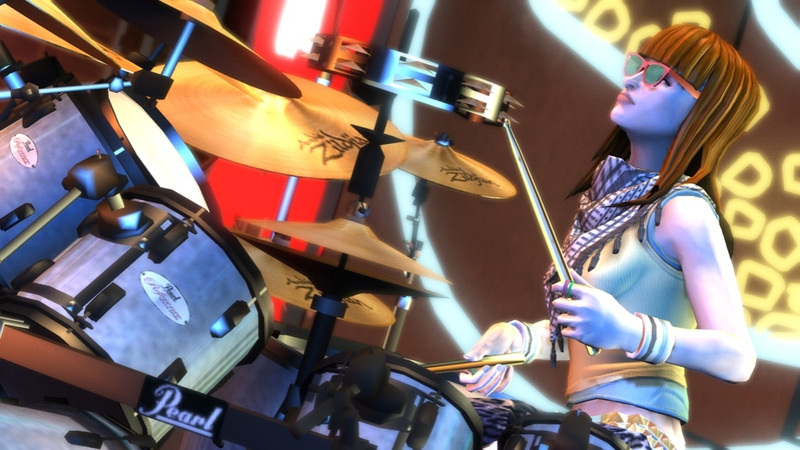 Without the pro instruments Rock Band 3 is a strong rhythm game but nothing extraordinary. With Pro Mode, and the new Pro instruments this game is a shining light in a genre that had become happy with mediocrity. Aprender a tocar un instrumento real, hacerlo apoyándonos en una base que se ajusta como anillo al dedo a las necesidades de cada jugador independientemente de su experiencia, es algo que hoy por hoy sólo ofrece este título. Como tal justifica toda inversión que debamos realizar para disfrutarlo, ya sea utilizando el estilo tradicional o sumergiéndonos en nuevas aguas, diríamos las más refrescantes que se pueden encontrar en el mercado. On ne sait pas si EA vendra des tonnes de Rock Band 3, surtout quand on connaît le prix des instruments, mais il est sans doute la référence actuelle du jeu musical. L'arrivée du clavier est une bénédiction et même en mode classique, le jeu brille par son gameplay affûté et la souplesse de son interface. Quant à l'intégration du mode Pro, aussi hard et limite élitiste soit-il, elle fait vraiment la différence entre Rock Band 3 et n'importe quel concurrent actuel ou à venir. Le jeu musical ultime, si c'est encore un jeu. 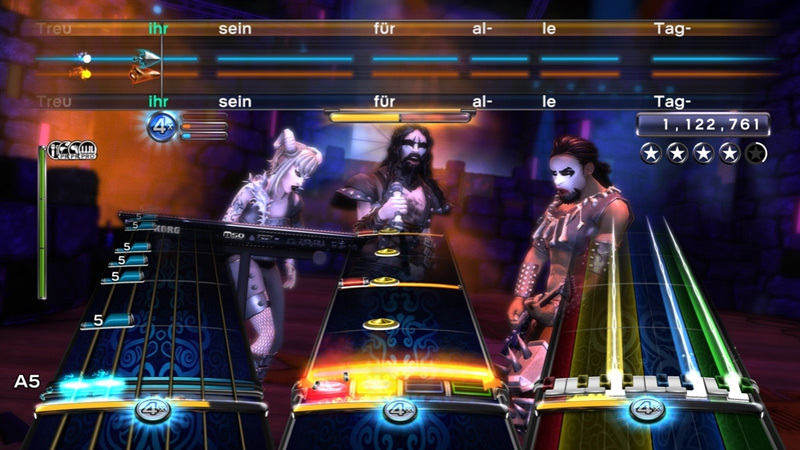 Pas de doute, Rock Band 3 est le nouveau jeu musical de référence. Avec son gameplay sobre et précis à tous les instruments, son interface désormais souple et bien pensée, et son mode Carrière flexible, le titre dépoussière l'antique Rock Band 2 et offre un bel écrin aux innombrables morceaux en DLC proposés dans le Rock Band Store. Mais il intègre de plus un nouvel instrument à part entière, le clavier, assez réussi, et offre aux joueurs acharnés plusieurs mois de galère et de sueur avec un mode Pro frustrant et difficile, mais ô combien fun et gratifiant. Rock Band 3 è e rimane un gioco, un'esperienza da vivere con gli amici che, incidentalmente, può anche insegnare i primi rudimenti per suonare uno strumento musicale. Si tratta di un assaggio perfetto per far capire alle persone, giocando, per cosa siano maggiormente portate, senza dover necessariamente fare investimenti azzardati. Och Rock Band 3 är mer eller mindre perfekt, och definitivt en milstolpe för genren. Det enda smolket i glädjebägaren är den stora investering som krävs för att utnyttja spelet till fullo; det är onekligen surt att behöva räkna i tusenlappar. Med det sagt finns ju möjligheten att använda gamla instrument, och att Rock Band 3 kan ge hundratals timmar underhållning för den som kanske bara äger en gitarr.